Have you ever been reading and article or watching a video and realized you needed to find on of your emails about something. Who wants to open a new browser tab and open Gmail or Inbox by Gmail. Guess what? You don't have to. You can search your emails from the Chrome Omnibox the same way you search the internet using the Chrome Omnibox. First of all, many of you are scratching your head and asking, what the heck is this Chrome Omnibox? Simple, its the same area that you would type in a URL/Web Address directly under the tabs you are viewing in the Chrome Browser. So how do you search your emails without opening Gmail or Inbox by Gmail? You need to add both Gmail and Inbox by Gmail search strings as a search engine in the Chrome Browser settings. Using the Omnibox, type "chrome://settings-frame/searchEngines" and press enter. This will open your list of search engines already setup. Add the appropriate search setup as shown in the image for Inbox by Gmail or Gmail. Note, the second column is the important item to remember. 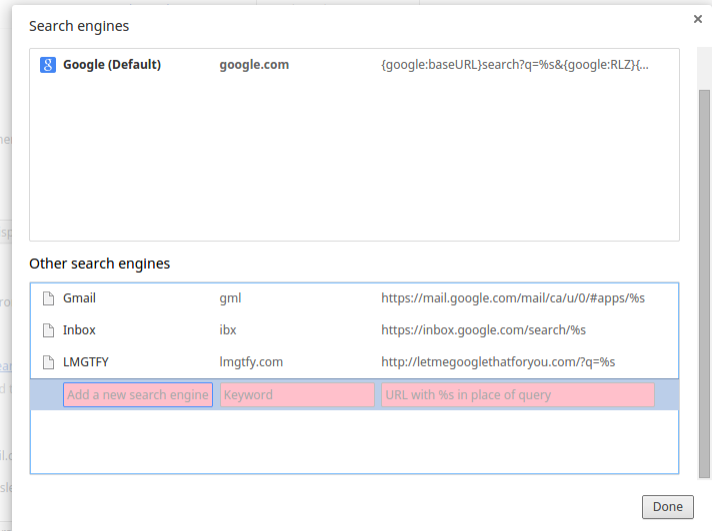 The keyword is what you will enter first to tell chrome where you are searching. Now you can go ahead and type whatever you are searching for. This will then open up Inbox by Gmail (or Gmail) with your search results. The keyword 'ibx' did not work for me in Chrome on Mac El Capitan. I changed it to 'inbox.google.com' and then it worked.